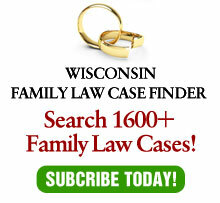 It is well-established that under Wisconsin law income from excluded, non-marital property, is marital property. However, the law is not as clear regarding the effect of appreciation of non-marital property. A recent court of appeals decision does little to clear up this confusion. With some degree of certainty, it is generally acknowledged that appreciation of a non-marital asset is non-marital if the asset appreciated due to normal market conditions. For example, in Wierman v. Wierman, the Supreme Court of Wisconsin held that an increase in value in a wife’s business interest resulting from her father’s successful management of the corporation was not marital property, because neither party actively caused the appreciation in value. the efforts produced substantial appreciation in the value of the property. While marital property classification may differ under Chapter 767 from Chapter 766, the court had held in Estate of Lloyd that the issues of sufficient effort and appreciation are the same in both the divorce and the death context. Also, in Schorer v. Schorer, the court held that the increase in the value of a separate corporation due to marital efforts is part of the marital estate. However, the court did not use the word “uncompensated” prior to the phrase “marital efforts”. This appears to have been an oversight by the court of appeals, rather than a change in the law. Similarly, in Ayres v. Ayres, relying on Plachta, the court of appeals excluded from the marital property division, the appreciation of stock value where the husband was gifted stock in the family’s corporation. Ms. Ayres argued that the increase in stock value was due to the husband’s efforts as an employee of the company. In rejecting her argument, the court said held that, “the record does not support [wife’s] contention that the appreciated value was attributable to [husband’s] efforts as opposed to other factors… the appreciated value did result from ‘the general accumulation of efforts of previous generations and general market conditions. Perhaps because it was unnecessary, the court ignored the question of whether Mr. Ayres’ efforts were compensated. Most recently, in, Richmond v. Richmond, the court of appeals reversed the trial court for including the entire amount of appreciation of a gifted farm in the martial estate. Although the court of appeals agreed with the legal standards applied by the trial court concerning appreciation of individual property, it determined that the trial court erroneously exercised its discretion in considering only contributions to the marriage in its entirety, instead of focusing on contributions during the four years of rapid appreciation in the value of the farm.Once again, the court failed to consider whether any of the efforts were compensated during the marriage. The issue of appreciation of non-marital property is too common and too important for an appellate court to treat haphazardly. Appreciation of a non-marital asset due to uncompensated effort by the non-owning spouse would be a windfall if awarded to the owning spouse. Similarly, if the marital estate already benefited from the appreciation through compensation — regardless of which spouse received the compensation, would provide a windfall to the non-owning spouse to include the appreciation once again in marital estate. Two potential problems are apparent with the “no (or inadequate) compensation” rule. First, it is not always easy to prove what efforts caused the appreciation. While this is true, it also not always easy to prove whether appreciation resulted from market conditions or other causes, which is the test if the court ignores compensation. Second, it may not be easy to determine what constitutes “adequate” compensation. On the other hand, making findings of this nature is why trial courts exist. While this determination may not be easy, a court exercising its discretion is performing precisely the role for which it was created – – avoiding an unfair result to either party. The assumption is that where compensation is not an issue, the court of appeals, rather than ducking their responsibility, simply used a short-hand recitation of the state of the law. Given the complexity and importance of the issue, it is submitted that the court should be more careful in the future in summarizing the law, unless it truly intends on changing it.